The U.S. Coast Guard is the only military organization within the Department of Homeland Security that is charged with protecting not only the marine transportation system and infrastructure, but also our natural and economic resources, and the territorial integrity of our nation – from both internal and external threats, natural and man-made. They protect these interests in U.S. ports, inland waterways, along the coasts, and on international waters. 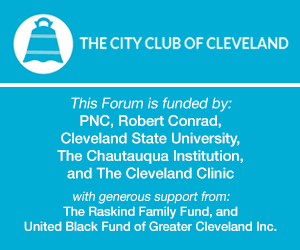 This is the City Club's annual State of the Great Lakes forum -- a conversation with Rear Admiral June E. Ryan, Commander of the U.S. Coast Guard Ninth Guard District.